In previous posts we learnt about various big data projects/systems, all of these systems are distributed and clustered in nature. For distribution and cluster management, all of them needs one or another low level API. ZooKeeper can be seen as one of those low level APIs which can be used to build a distributed co-ordination system. "ZooKeeper allows distributed processes to coordinate with each other through a shared hierarchical name space of data registers". ZooKeeper is a centralized service for maintaining configuration information, naming, providing distributed synchronization and group services. It provides a very simple interface to a centralized coordination service. The service itself is distributed and highly reliable. Distributed applications use Zookeeper to store and mediate updates to important configuration information. Many top level big data projects like Hadoop, Kafka, HBase, Accumulo, Solr uses ZooKeeper as a distributed co-ordination system. Extensive list of projects powered by ZooKeeper can be found here. As ZooKeeper wiki says it coordinates using a shared hierarchical data registers, in ZooKeeper terms these registers are known as ZNODEs. ZooKeeper is fast with workloads where reads to the data are more than writes. The ideal read/write ratio is about 10:1. 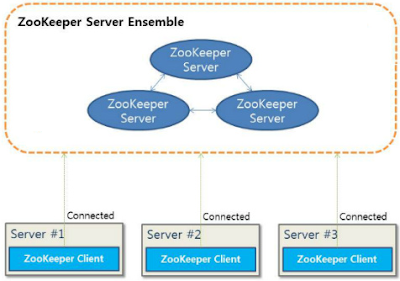 ZooKeeper is replicated over a set of servers known as ensemble. All the servers are visible to each other. The ZK service is available hence there is no single point of failure. ZooKeeper follows a simple data model and maintains a standard hierarchical name space, similar to files and directories on a file system. Apache Spark is an open source cluster computing platform/framework which brings fast, in-memory data processing to Hadoop. Spark's expressive development APIs allow data workers to efficiently execute streaming, machine learning or SQL workloads that require fast iterative access to datasets. It extends well known MapReduce model to further efficiently support various types of computations, including interactive queries and stream processing. Speed is the key in processing large datasets. If we have large amounts of data that requires low latency processing that a typical MapReduce system cannot provide, Spark is the right choice, it performs at speeds up to 100 times faster than Map Reduce for iterative algorithms or interactive data mining as it provides in-memory cluster computing for lightning fast speed. Apache Spark consists of Spark Core and a set of libraries. The core is the distributed execution engine and the Java, Scala, and Python APIs offer a platform for distributed ETL application development. Spark was originally developed in the AMPLab at University of California, Berkeley and later donated to Apache Foundation. Note that Generally Spark is used on the top of HDFS. At a high level we can say we may use Spark Core in conjuction with HDFS. Spark combines SQL, streaming and complex analytics together in the same application to handle multiple data processing scenarios. It can access wide range of data sources such as HDFS, Cassandra, HBase or S3. Extensive list of users and the projects powered by Spark can be found here. Apache Spark's key use case is its ability to process streaming data. With so much data being processed on a daily basis, it has become essential for organizations to be able to stream and analyze it all in real time. Spark has useful implementation of machine learning capabilities including wide variety of machine learning algorithms like classification, recommendation, clustering, pattern-mining and so on. Initially Hadoop MapReduce was developed to handle batch processing and SQL-on-Hadoop engines such as Hive or Pig are extremely slow for interactive analysis, where as Spark provides very fast queries to support interactive analysis using its in-memory capabilities. In other words we can say Spark is a batch analytics system that can pretends as an interactive analytics system because of operating on in-memory RDD's and the caching hence possible. In previous post we learnt about setting up and runnning Hive on our distributed Hadoop cluster. In this post we will learn about various Hive input and output formats. We will use same Hadoop cluster and Hive setup done in previous post. Separated readable text file e.g. text file with tab or comma separated fields. This is the default format for Hive (depending on hive.default.fileformat configuration). We learnt about Cassandra in previous post. We will setup and run client on an Cassandra cluster(fully distributed) here. Note that in Cassandra there is NO SINGLE POINT OF FAILURE, hence all the nodes are equal and there is no MASTER or SLAVE. Download Apache Cassandra binary from Apache Website. Repeat above steps for all the three nodes. In the previous post we learnt about the basics of Cassandra and CAP theorem, in this post we will have a closer look at Cassandra data model and working of Cassandra. 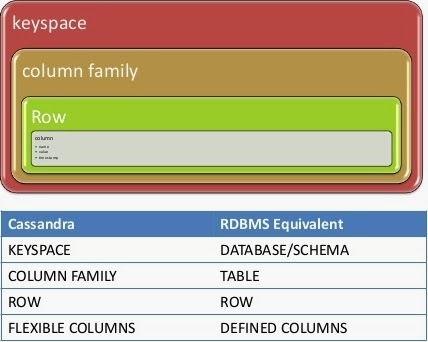 Cassandra is can be defined as a hybrid between a key-value and a column-oriented database. In Cassandra world the a data model can be seen as a map which is distributed across the cluster. In other words a table in Cassandra is a distributed multi-dimensional map indexed by a key. Open Source enthusiast, Linux hobbyist, Physics lover and fairly good at few other things. Computers and Internet are the best things I came across in my life. I believe and follow artistic passion.